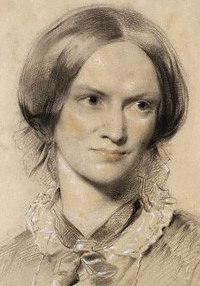 Today's writer is Charlotte Brontë. Jane Eyre is one of the books of my heart. I loved her stubborn independence, her indomitable strength, and her fierce pride. When I read the book for the first time, probably in middle school, I was an immediate convert. The story gave me everything I loved in Gothic romance without a ninny as the heroine (a failing in too much of the genre). I've read it several times since, and I love it every time. I didn't learn much about you yourself and your family until later. As a college student, I studied a bit of biographical detail, enough to become fascinated by your family. I still have in the back of my mind some kind of book around your brother Branwell, the one Brontë who never seemed to produce anything of worth . . .and also the only boy. Your life and your work are like that: mysterious and interesting. No wonder Jean Rhys couldn't resist writing a backstory for poor Bertha, the quintissential madwoman in the attic in her Wide Sargasso Sea. I also loved Romancing Miss Brontë, Juliet Gael's imagining of your life. I wonder what you would think of having become such an object of interest. Would you have enjoyed Rhys's reinterpretation of your work? It's hard to know. You were a private person, but not a recluse. You enjoyed a few perks of celebrity, I think. Whenever I imagine you, you are walking out on the moors that featured so strongly in your work and that of your sisters. Wind is whipping your hair across your face and bringing unexpected color into pale cheeks. You come back home looking as if you've been mussed by a lover, but it was your muse who left you rumpled. I only wish you'd lived long enough to write more books! As a survivor of emotional/verbal abuse most of my childhood, I very much related with Jane's growth past her childhood hardships as well. Although I always that the resolution with her and Edward's relationship was a bit... 'Deus Ex Machina' to me. Still love the story nonetheless, though! I <3 Jane Eyre SO HARD. I haven't read it again in years because I feel like some of the things I loved about it so much as a teen are going to aggravate me as an adult woman, but I'm sure I'll wind up there again. I will have to go book hunting. I'm fond of some of the Austen continuations I've read, but I don't think I've ever seen any off of Jane Eyre. 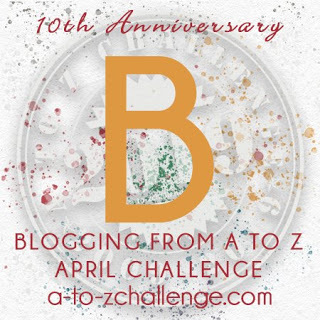 This is such a cool A to Z theme, and your letter to Ms. Bronte is beautifully written. I have a copy of Jane Eyre I have yet to crack open. Perhaps I should expedite it to the top of my "To Read" stack. 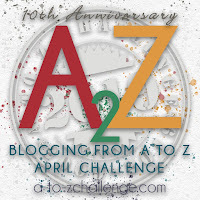 This is a really cool theme for the blogging challenge!